Australia completed a comprehensive victory over England in the fourth Ashes Test at Headingley, Leeds, winning by an innings and 80 runs inside three days to level the series at 1-1 with just the deciding Test match at The Oval still to play. Resuming the third morning in a seemingly impossible position, trailing by 261 runs on 82 for five after Australia’s first innings 445, England’s daunting task became all the more difficult when they lost two wickets inside the first hour. Despite a boundary-filled 108-run eighth-wicket partnership between Stuart Broad and Graeme Swann, England slumped to 263 all out six overs after lunch. The result means Australia only need a draw, when the fifth Test begins on August 20, to retain the Ashes for another two years. Broad (61) and Swann (62) delayed the seemingly inevitable with their partnership off just 79 balls that delighted home fans after the pair had come together with England on 120 for seven, At lunch, England had moved onto 245 for eight, 98 runs behind, with Swann 56 not out and Stephen Harmison six not out. But soon after the break Swann, just one run shy of his Test-best score, was caught behind off left-arm paceman Mitchell Johnson, who took five wickets for 69 runs in the innings. 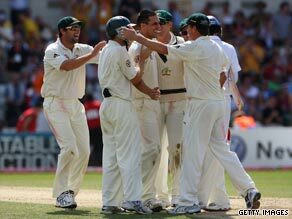 Johnson then wrapped up the match in the sixth over after lunch when he clean bowled last man Graham Onions for a duck. England, without injured stars Andrew Flintoff — the inspiration behind their 115-run second Test win at Lord’s — and Kevin Pietersen, were on the back foot from the start after collapsing to 102 all out on Friday’s opening day. Stuart Clark took three wickets for 18 runs on his return to international cricket and Peter Siddle a Test-best five for 21. Australia, in reply, were 151 for four, just 49 runs ahead, before a stand of 152 between Marcus North, whose 110 was his second century of the series, and vice-captain Michael Clarke (93) all but doubled their score to give Australia a formidable lead.